Butler guard Ethan Morton goes up for a shot over Shaler's Justin Desabato during the Golden Tornado's 56-37 home section win Tuesday night. Morton only scored 10 points, but also had 10 assists and nine rebounds in the victory. BUTLER TWP — When it came to shooting, Ethan Morton had a bad night. When it came to playing, Butler's boys basketball team had a good one. Morton sank only three of 11 shots from the floor, but compiled 10 assists and nine rebounds in the Golden Tornado's 56-37 Section 1-6A victory over Shaler. “Most people judge Ethan by how many points he scores,” Butler coach Matt Clement said of his sophomore guard. “Ethan judges himself by how many assists and rebounds he gets. Butler (14-2, 6-2) had a 10-point lead at halftime, but the Titans (7-9, 2-6) began the third period with a lay-up by Jesse Tavella and offensive rebound and stick-back by Luke Bebout to pull within 26-20. The Tornado took off from there. Butler outscored Shaler 22-6 the rest of the quarter. The Tornado led by as many as 26 (52-26) with 7:14 to play in the game. John Michalek sank a trey, then beat the pursuit to the hoop for a lay-up. Luke Michalek drove in for a pair of lay-ups and Mattix Clement got hot during the spurt. Clement drained a pair of treys — completing a four-point play after the first — on consecutive possessions. The shots turned a 12-point Butler lead into a 19-point bulge with 40 seconds left in the third quarter. “He's probably the best pure shooter I've ever played with — and he's only a freshman,” Morton said of Clement. “He's a nice weapon to have. Coach Clement said Mattix “knows his role and he's able to square up for his shot. “Not too many teams are going to have a guy guard a freshman out by the three-point line. I wish they would. That would open up a lot of things for us,” the coach added. Mattix Clement led Butler with 13 points, sinking four treys. Luke Michalek had 10 points, five rebounds and three assists while Morton had 10 points. Shaler had a rough night shooting, hitting just 12 of 47 shots from the floor for 26 percent and eight of 16 free throws. 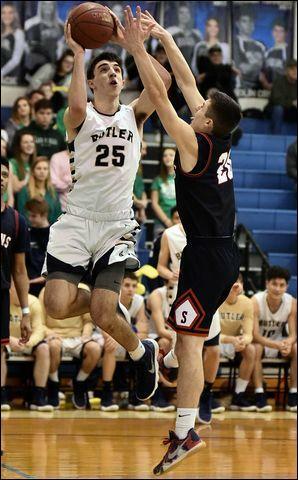 “Butler played good defense, but we had a lot of open looks and just didn't knock them down,” Shaler coach Rob Neiderberger said. “You need to get stops defensively — and we got some — but you need to convert them into points at the other end. Mekhi Reynolds was the lone Titan in double figures with 14 points. He added nine rebounds. Kiki Agbale grabbed 10 boards for Shaler. Butler got a win four days after a 27-point loss at North Hills and before a game at Pine-Richland Friday night. “This was an important game for us and the kids played like it,” Clement said. Pine-Richland has defeated Butler five times in the past two yeasrs,. Kevin McHale 0-9 0-0 0, Jesse Tavella 1-7 0-0 2, Mekhi Reynolds 4-16 4-4 14, Kiki Agbale 2-3 `1-6 5, Luke Bebout 1-4 0-0 2, Justin DeSabato 2-4 3-4 8, Matt Tavella 1-2 0-0 3, Luke Grunden 0-2 0-0 0, Matt Bendel 1-1 0-0 3. Totals: 12-47 8-16 37. Luke Michalek 4-10 0-0 10, John Michalek 2-4 1-2 6, Doug Kostelansky 0-0 0-0 0, Mattix Clement 4-9 1-1 13, Tarik Taoufik 3-6 0-0 6, Luke Patten 2-5 0-0 4, Mason Montag 1-3 0-0 2, Ethan Morton 3-11 3-4 10, Dom Schmidt 0-0 2-2 2, Isaiah Scribner 1-1 0-0 3, Colby Anderson 0-1 0-0 0, Nick Stazer 0-0 0-2 0. Totals: 20-50 7-11 56.